Those of you who were using a smart phone before the iPhone may know that a certain previously popular smart phone (cough, cough, Treo, cough) has great voice control features that were created by a company called Voicesignal. We can tell you from first hand experience that their voice software is simply fantastic. No training is necessary and you can do almost anything you can do with your hands by just talking. For example, using only your voice, you can call contacts at specific numbers (i.e. car, home, mobile, office), initiate an email to a specific contact at a specific email address, launch any application, etc. Well, the folks at Voicesignal were shrewd enough to also notice that the iPhone doesn't have any voice control and they have already written some iPhone software which will solve this problem. The Video below contains 2 demonstrations of the super-powers this software will have. The video will play on all computers, even iPhone's surfing with EDGE. Just in case you're too lazy to watch, we'll sum up the video. In the first demo, the user says the name of a band and the Phone starts playing their music. In the second demo, the user says a state and city and asks for hotels, at which point the iPhone launches Google maps and returns the appropriate search results. Unfortunately, this software is not yet available, but you can bet your bippy it will be when the iPhone Applications store opens this June. Every other website in the world is now regularly reporting the same iPhone rumors. 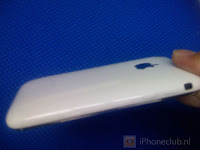 Basically, we've got pictures of the 3g iPhone case which show that the new iPhone is indeed fatter the the previous one. It also suggests that there will be a white iPhone to go along with the recently discovered black iPhone. We think this is very likely. Apple has had great success with the white/black products as evidenced by the iPod and Macbook. If it is true, the black version will definitely be more expensive. The latest iPhone SDK has shown us a new button that allows you to turn off 3g features, supposedly to save battery. We've also seen a few industrious snoops track Apple shipping containers as the left China and entered America. The containers apparently contained a device called "electronic computer" which is different nomenclature than Apple has used in the past. Some are speculating that this "electronic computer" is a new tablet device that Apple will soon release. Think Giant iPhone. Allow us to be the first to say that this rumor is all fooey. Apple will not release a tablet computer because tablets don't sell. Yes, they could make one, but it wouldn't sell, so they won't. 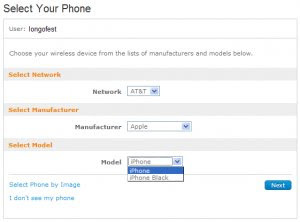 Over the weekend, ATT let the cat out of the bag and started listing a "Black iPhone" on their order page. Cool. Also of interest is a series of rumors pointing to an iPhone 3G release date BEFORE the June 9th WWDC. That would be even cooler.